Link to the article above. Thanks to Andrew Baker for pointing me to this article on healthy lowfat diets versus healthy lowcarb diets. Of these two ideas, time-restricted eating is by far the most important idea. But eating foods low on the insulin index when you do eat makes it much, much easier to go for periods of time without eating at all—whether those periods without eating are the last few hours before bed and then skipping breakfast the next day, or going without eating for more extended periods of time. So it is worth understanding what low-insulin-index eating is. The point is that white fish and steak are in the 30-50 insulin index category I label "Portion Sizes Should Be Kept Small Except on Special Occasions." They are not foods to make a regular part of your diet if you want to eat low on the insulin index, any more than chocolate milk, snickers bars or cinnamon swirl pastry. Because the insulin index has not been measured for everything, particularly in all the shrouded variations that occur in processed food, an important test is to think of how hungry you feel an hour or two or three after eating something. I do eat meat in restaurants, but I feel just a bit hungry afterwards. I deal with that by eating a mix of almonds and cashews afterwards. So white fish and steak (and presumably a range of other types of meat that we don't have a measured insulin index for) are not freebies; they are medium-high on the insulin index—not so high that you shouldn't ever eat them, but high enough that you should eat them sparingly. The bottom line is that a low-insulin-index diet is not exactly a "lowcarb diet" in the usual sense of a "lowcarb diet" in our culture. Even less is a low-insulin-index diet a "lowcarb diet" in the sense that researchers often use. As far as the insulin index is concerned, the problem is not really carbohydrates, but easily-digestible carbohydrates such as all the many types of sugar and the most obviously starchy-seeming kinds of vegetables. Technically, even non-starchy vegetables and nuts have a lot of "carbohydrates," but these are carbohydrates that are digested slowly, so they don't cause much of an insulin spike. To repeat, it isn't "carbohydrates" that are the problem, but easily-digestible carbohydrates. Raw vs. Cooked; Intact vs. Pulverized. One of the intriguing facts pointing to the importance of whether a type of cabohydrate is easily-digestible or not is one I discussed in "The Keto Food Pyramid": cooked carrots have a higher glycemic index than raw carrots. The glycemic index isn't the same thing as the insulin index, but within the same food group it is highly enough correlated with the insulin index that I use the glycemic index to guess the insulin index when direct data on the insulin index is not available. What this means is that you have to think not only about the processing of food by big food companies, but the processing of food that you do at home! In addition to what food you eat, you need to think about what you do to it before you eat it. Cooking carrots makes them easier to digest, so they cause a bigger spike in blood sugar. I don't know of anyone having done this experiment, but I'd love to see someone measure the insulin index of intact veggies as compared to veggies that have been run through a blender to make a veggie smoothie. I am betting that the veggie smoothie will have a higher insulin index than the very same ingredients if they are eaten intact. 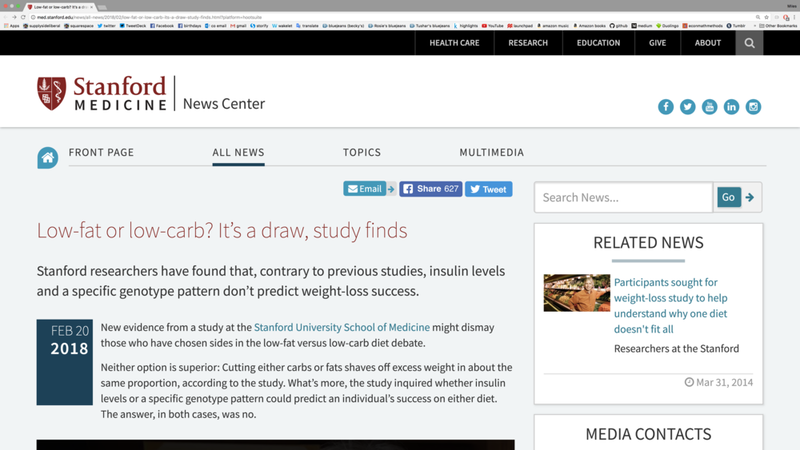 Let me use this distinction between a low-insulin-index diet and a lowcarb diet to discuss the recently reported results of the DIETFITS Randomized Trial flagged at the top of this post. The video of Christopher Gardner, in particular, is good at explaining what they did. Results Among 609 participants randomized (mean age, 40 [SD, 7] years; 57% women; mean body mass index, 33 [SD, 3]; 244 [40%] had a low-fat genotype; 180 [30%] had a low-carbohydrate genotype; mean baseline INS-30, 93 μIU/mL), 481 (79%) completed the trial. In the HLF [Healthy Low Fat] vs HLC [Healthy Low Carb] diets, respectively, the mean 12-month macronutrient distributions were 48% vs 30% for carbohydrates, 29% vs 45% for fat, and 21% vs 23% for protein. Weight change at 12 months was −5.3 kg for the HLF diet vs −6.0 kg for the HLC diet (mean between-group difference, 0.7 kg [95% CI, −0.2 to 1.6 kg]). There was no significant diet-genotype pattern interaction (P = .20) or diet-insulin secretion (INS-30) interaction (P = .47) with 12-month weight loss. There were 18 adverse events or serious adverse events that were evenly distributed across the 2 diet groups. (b) The difference between the two diets is stated in terms of differences in proportions of calories from the three macronutrient categories of fat, protein and carbohydrates, which lumps both the unhealthy easily-digestible carbs and the healthy carbs in things such as nuts and nonstarchy vegetables together under the heading of carbohydrates . (c) Viewed from the perspective of the insulin index, the difference between the two diets was relatively modest, which makes it less surprising that there was little difference in the results. If you are already avoiding sugar, refined grains, and processed foods, then cutting back further on what are technically carbohydrates in a scattershot way that doesn't pay attention to the insulin index is not that valuable. On the other side, trying to cut back on fat is not particularly valuable. (d) The study did not have a formal control group that continued to eat as they would have normally. But if one is willing to think of people in the population at large as if they were a control group (technically "adults aged 18 to 50 years without diabetes with a body mass index between 28 and 40") then the weight-loss relative to that "control group" is impressive. So the elements the two diets had in common seemed helpful: avoid sugar, avoid refined grains and avoid processed foods. These are all things that can dramatically lower the insulin index of the food one eats, even if one is not thinking explicitly about the insulin index. (e) The researchers looked for interactions between individual differences in insulin-secretion across people and which diet worked better for that individual and didn't find anything. Here I think there was a big missed opportunity. If you are looking for interactions between differences between two diets and the insulin-secretion patterns of different individuals, to find anything you need to make the two diets quite different in their food insulin indexes. Despite being interested in differences in insulin secretion patterns across people, these researchers did not do the logical thing of focusing on a high food-insulin-index diet and a low food-insulin-index diet. I hope they focus on this in their next big study! ... the low-fat group was told to avoid those things and eat foods like brown rice, barley, steel-cut oats, lentils, lean meats, low-fat dairy products, quinoa, fresh fruit and legumes. The low-carb group was trained to choose nutritious foods like olive oil, salmon, avocados, hard cheeses, vegetables, nut butters, nuts and seeds, and grass-fed and pasture-raised animal foods. ... both groups ultimately ended up consuming fewer calories on average by the end of the study, even though they were not conscious of it. The point is that they did this by focusing on nutritious whole foods that satisfied their hunger. A low-insulin-index diet is not the same thing as a "lowcarb diet" either as the phrase "lowcarb diet" is used in common speech or as "low-carbohydrate-diet" is used in nutrition research. All of these involve avoiding sugar, refined grains and processed foods, which is a big deal. But beyond that, they are different. It is unfortunate that the results of the DIETFITS study were reported as showing that a lowcarb diet and a lowfat diet were equally good, when in the nontechnical sense of what most people mean when they say "lowcarb diet" both diets were "lowcarb" because they both involved avoiding sugar, refined grains and processed foods. (You can see another example of such reporting here in this otherwise excellent article.) Note here that the researchers who did the DIETFITS study did not question the idea that sugar is bad, despite the dispute about just how bad sugar is that I discuss in "The Case Against Sugar: Stephan Guyenet vs. Gary Taubes" and "The Case Against the Case Against Sugar: Seth Yoder vs. Gary Taubes." (See also "How Sugar Makes People Hangry" and "Sugar as a Slow Poison.") In the language of the team who did the DIETFITS study, both a "Healthy Low-Carbohydrate Diet" and a "Healthy Low-Fat Diet" are low in sugar, refined grains and processed foods. At a deeper level, here is the important point: It isn't eating lowcarb that is important. The most important element of an effective diet is time-restricted eating. The second most important element of an effective diet is food and drink low on the insulin index.